I have walked past the statue (donation box) of the Laughing Buddha outside Da Sheng Hong Kong Pastry in Sago Street many times in the last five years, so I thought I would sketch a souvenir. I perched on my little stool directly in front of the statue in the early morning before it got too hot. Sitting in one of the busiest tourist thoroughfares in Singapore caused a few jams as families and coach parties gathered round to take a look and say things which I think were complementary. At one point, a tiny Japanese girl stood out of sight behind me while moving an iPhone on a selfie stick next to my sketchbook. 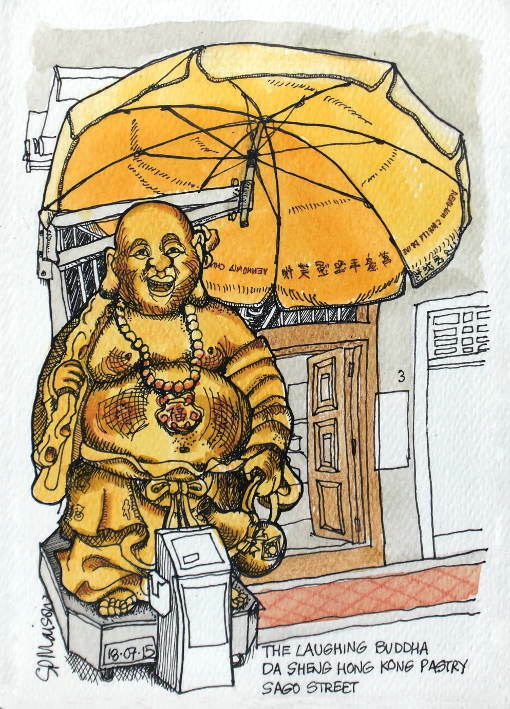 When I finished, I sat on a step behind the Buddha Tooth temple with a flask of coffee and a very warm cheese ciabatta sandwich watching the world go by. I will certainly miss Chinatown.